In the decades since the 401(k) was created, the drive to encourage people to save has been supported by a range of tools from plan design and education to use of social media and peer comparisons. Research has concluded that the ideal path to retirement readiness is through the workplace. But with many workplaces still without a retirement savings plan, workers will not benefit from any of this progress. Today, there are some 42 million individuals who do not have access to a workplace savings plan (Source: Bureau of Labor Statistics). These workers will likely see a significant reduction in income when they retire, even with Social Security benefits. To improve retirement security for all workers, closing the access gap must be a top priority. There are many reasons why traditional workplace savings plans are not available to all workers. Some employers, particularly smaller companies, report challenges to offering a retirement plan due to cost and regulatory requirements. Workplace plans may also not fit the evolving labor market landscape. Since the Great Recession there have been major shifts in types of employment. While many workers started their own businesses after the downturn, some entrepreneurs still do not set aside money for their own retirement. Temporary workers, who may lack retirement plans, remain among the fastest-growing segments of the workforce. To meet this savings challenge, several national proposals have been offered on Capitol Hill, including auto-IRAs, multiple-employer plans, or the creation of “starter” or simplified 401(k)s. These ideas would provide a retirement savings opportunity to millions of workers without a plan. Policy can also encourage employers to help narrow the gap. Providing refundable tax credits could help more employers sponsor plans, and engage part-time or contract workers. Individual tax credits to match contributions could also serve as incentives for workers to enroll in plans. Congress may consider providing matching tax credits — perhaps 50% up to the first $1,000 saved — to encourage contract workers to start saving. Technology will also undoubtedly play a key role, especially with this mobile workforce. This could involve creating an easy savings system where workers could sign up online with an advisor and have a percentage of their income sent to an account whenever they get paid from any employment source. Most selections could be made online. More complex decisions could be made with the help of an advisor via Skype or Facetime. These ideas are just the beginning of what could result in a new wave of innovation in retirement savings. 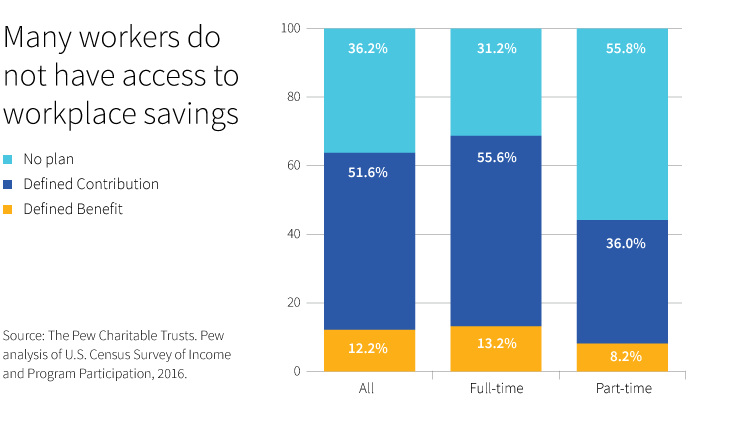 The goal is clear and achievable: Let’s close the access gap and offer a savings option to all workers who pay into the Social Security system.